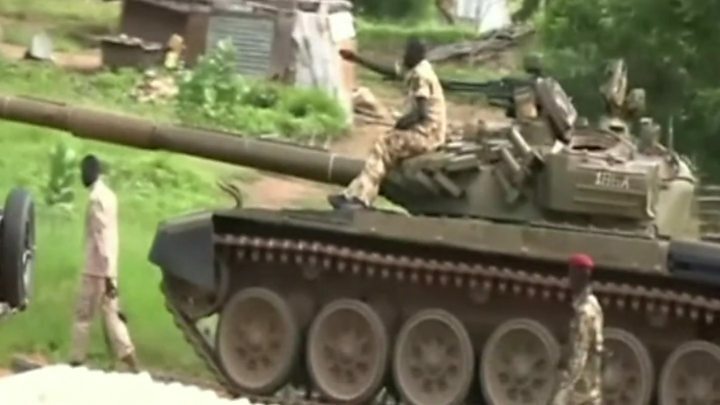 South Sudan clashes: US says violence "must stop"
Media captionWhat's happening in South Sudan? The United States has said an outbreak of violence that has left hundreds dead in South Sudan "must stop". Anyone impeding efforts to end the fighting would be held fully accountable, the White House warned. The UN has called for an immediate arms embargo, as well as attack helicopters to strengthen its peacekeeping force. Days of fighting between forces loyal to President Salva Kiir and Vice-President Riek Machar in the capital, Juba, has left hundreds dead. A ceasefire was called on Monday but it is not clear whether the violence has subsided. Heavy gunfire continued to be heard in the capital after President Kiir's ceasefire order came into effect at 1800 local time (1500 GMT) on Monday. Two Chinese UN peacekeepers and one South Sudanese UN worker are among the hundreds of dead. The US's National Security Adviser, Susan Rice, said: "This senseless and inexcusable violence - undertaken by those who yet again are putting self-interest above the well-being of their country and people - puts at risk everything the South Sudanese people have aspired to over the past five years." South Sudan became independent from Sudan in 2011 but its short history has been marred by years of civil war. The BBC's James Copnall says the latest clashes have traumatised Juba and shredded a peace deal between Mr Kiir and Mr Machar, agreed last August. Thousands of people have had to leave their homes. Hundreds of them have sought refuge in UN premises, including Jebel and Tomping bases in Juba which were caught in crossfire on Monday. UN Secretary-General Ban Ki-moon said: "Yet again, the leaders of South Sudan have failed their people. Rarely has a country's conduct squandered so much promise so quickly." Mr Ban said an "immediate" arms embargo should be imposed on South Sudan, political and military leaders blocking the peace deal should be sanctioned and the UN mission to the country should be fortified. He also called for military equipment "to fulfil our mandate to protect civilians" and said countries with troops in South Sudan should "stand their ground" rather than withdraw in the face of the violence. The international community played a major role in the creation of South Sudan and has tried to exercise some influence since independence in 2011. The UN and US have called for an immediate end to fighting, a call echoed by the East African regional group which brokered the recent peace deal.